The Work and Lifeskills Pathway is an important part of the ESF Curriculum. Students engaged in that pathway are either part of mainstream schools supported by Learning Support Centres or they are attending the Jockey Club Sarah Roe School. We offer work placements and job coaches – contact Fion Ng, Career Development Manager, at fion.ng@esfcentre.edu.hk for more details. Click here for more details on our Career Development Service. 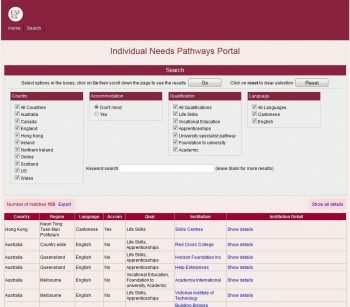 The Individual Needs Pathways Portal allows you to search for worldwide post 18 progression options for your child. For a follow up conversation please speak to the Higher Education Counsellor or a member of the Individual Needs Department at your school. Click on the image to go into the Individual Needs Pathways Portal.